building organization provides is the opportunity for ordinary ordinary people to showcase an extraordinary transformation The exclusive beauty is in the natu- ral aspect of of the the transformation In the the fall of of 2015 the NGA East Coast Natural Pro/Am Championships decided to find a a a few butterflies and incorporate them into their show in in State College Pennsylvania After competing and attending so many different shows and constantly talking with competitors we realized there were so many athletes that had com- pelling stories to to to tell of how they got to to to be on stage Every competitor who steps on to to a a a a natural stage has “natural” bragging rights but there are many whose stories are much bigger than most people could ever imagine Thus the Transformation Divi- sion was born to the NGA on on September 26 2015 So how does it it work? 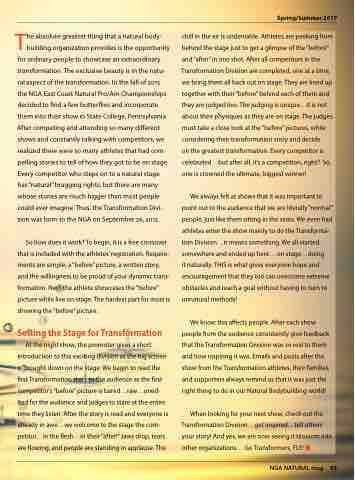 To begin it it is a free crossover that is is included with the athletes’ registration Require- ments are simple a a a “before” picture a a a written story and the willingness to be proud of your dynamic trans- formation Next the the athlete showcases the the “before” picture while live on-stage The hardest part for most is showing the “before” picture Setting the Stage for for Transformation At the the night show the the promoter gives a short introduction to this exciting division as the big screen is brought down on the the stage We begin to read the the first first Transformation story to to the the audience as the the first first competitor’s “before” picture is bared raw uned- ited for the the audience and judges to stare at the the entire time they listen After the the story is is is read and everyone is is is already in awe we we we welcome to the the stage the the com- petitor in in the the flesh in in their “after!” Jaws drop tears are are flowing and and people are are standing in in in applause The behind the the stage just to get a a glimpse of the the “before” and “after” in in one shot After all competitors in in the Transformation Division are completed one at at a a a a a time we bring them all back out on stage They are lined up together with their “before” behind each of them and they are judged live The judging is is unique it is is not about their physiques as they are on stage The judges must take a a a close look at the “before” pictures while considering their transformation story and decide on on the greatest transformation Every competitor is celebrated but after all it’s a a a a competition right? So one is crowned the ultimate biggest winner! it naturally THIS is what gives everyone hope and encouragement that they too can overcome extreme obstacles and reach a a a a a a goal without having to to turn to to unnatural methods! the the Transformation athletes their families and supporters always remind us us that it was just the right thing to do in in in our Natural Bodybuilding world!